I arrived in New Orleans late yesterday afternoon after a full 10 hours of travel. I could not get a direct flight at a reasonable price, so I flew from Philadelphia to Chicago and finally to New Orleans. My 90 minutes in Chicago was spent running from one end of the airport to the other as they changed gates for the oversold flight 3 times. 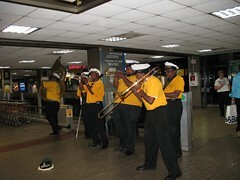 It was great to arrive in the Big Easy and be greeted by an awesome Dixie band — it made all the hassle worthwhile and lifted my spirits. The shuttle from the airport was very effecient. As we drove in to downtown New Orleans it was surprising to see the disparity between the few areas that were not affected as badly and/or have already been repaired and the majority of the city which still hase a long way to go before normalcy can resume. I felt awe and gratitude for those that have remained and are doing all they can to rebuild. I felt proud to be here and helping out (even if only in a small way when the scope of the situation is considered). I have always been proud to be a librarian, this week I feel just a little bit prouder. 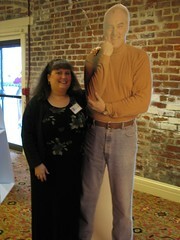 I went immediately to the WebJunction member reception. I have been a WJ member for 3 years and have been a moderator on the Community Forums and a WJ Adovcate for almost the entire time. It was a wonderful reception — I got to catch up briefly with Chrystie Hill (we presented together at Internet Librarian in Monterey a few years back), meet Patrick Hogan of ALA Editions (I am going to be on the editorial board for the next few two years) and also have an insightful conversation with Walt. Oh, and I also got “George Needham’d”, but this was with the cardboard version and not the live version like Pete! 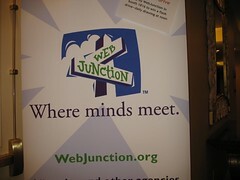 If you are not yet a member of WebJunction, check it out when you have a moment. The community forums is where you will find me — posting under JanieH! I am currently doing the exhibits and then have several events with CLENE that will keep me busy for the rest of the day. I am posting this from the Internet Cafe at the convention center because the wireless connection from my room at the Hilton does not seem to work PLUS it is expensive (hotels without free wireless are not acceptable, IMHO). I will post when I can get a connection.